The Widest Opening Curtain on the Market! 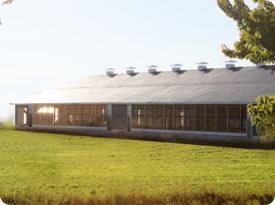 Vista curtain systems can be described as poly curtains that cover the sidewall ventilation openings on a livestock housing building when closed. When ventilation air is needed for temperature control & fresh air supply, the curtain can be opened from the top downwards to provide air into & through the building. This system doesn’t require a mid opening header which means that when the curtain is fully open the sidewall is completely unobstructed. As Vista curtain systems open, the curtain material, instead of simply folding downwards, is rolled into a pipe that rotates at the bottom of the curtain. In the summer months, the curtain can be completely detached from the bottom and stores overhead. The self-regulating/synchronizing system ensures that the curtains are always tight (no cable jumping). The Vista curtain system is safer then the alternatives on the market as it doesn’t operate using an exposed drive shaft. For openings up to 15’ tall and spanning up to 300’. Curtains are always tight (no cable jumping). Can be stored overhead in summer months. Minimal dead air (50% less than competitors). Safer than the alternatives (no exposed drive shafts). Galvanized cover and poly boot. No mid opening header required.